Carcharhinus is the type genus of the family Carcharhinidae, the requiem sharks. One of 12 genera in its family, it contains over half of the species therein. It contains 35 extant and 8 extinct species to date, with likely more species yet to be described. ^ Carrier, J.C.; J.A. Musick & M.R. Heithaus (2004). 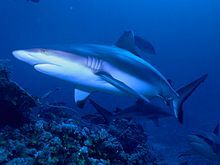 Biology of Sharks and Their Relatives. CRC Press. p. 52. ISBN 0-8493-1514-X. ^ Froese, Rainer, and Daniel Pauly, eds. (2011). Species of Carcharhinus in FishBase. February 2011 version. Adnet, S.; P.-O. Antoine; S.R. Hassan Baqri; J. Crochet; L. Marivaux; J. Welcomme, and G. Métais. 2007. New tropical carcharhinids (chondrichthyes, Carcharhiniformes) from the late Eocene–early Oligocene of Balochistan, Pakistan: Paleoenvironmental and paleogeographic implications. Journal of Asian Earth Sciences 30. 303–323. Accessed 2019-03-05. Aguilera, Ó, and D. De Aguilera. 2001. An exceptional coastal upwelling fish assemblage in the Caribbean Neogene. Journal of Paleontology 75. 732–742. Accessed 2019-03-05. De Araújo Távora, Vladimir; André Augusto Rodrigues dos Santos, and Raphael Neto Araújo. 2010. Localidades fossilíferas da Formação Pirabas (Mioceno Inferior). Boletim do Museu Paraense Emílio Goeldi 5. 207–224. Accessed 2017-08-15. Carrillo Briceño, Jorge D.; Erin Maxwell; Órangel A. Aguilera; Rodolfo Sánchez, and Marcelo R. Sánchez Villagra. 2015. Sawfishes and Other Elasmobranch Assemblages from the Mio-Pliocene of the South Caribbean (Urumaco Sequence, Northwestern Venezuela). PLoS ONE 10. e0139230. Accessed 2019-03-05. Cicimurri, D.J., and J.L. Knight. 2009. Late Oligocene sharks and rays from the Chandler Bridge Formation, Dorchester County, South Carolina, USA. Acta Palaeontologica Polonica 54. 627–647. Accessed 2019-03-05. Halstead, L.B., and J.A. Middleton. 1974. New material of the archaeocete whale Pappocetus lugardi Andrews, from the middle Eocene of Nigeria. Journal of Mining and Geology 8. 81–85. Harris, Mark; Peter M. Kyne, and William T. White. 2019. Lost before found: A new species of whaler shark Carcharhinus obsolerus from the Western Central Pacific known only from historic records. PLoS ONE 14. e0209387. Accessed 2019-03-05.